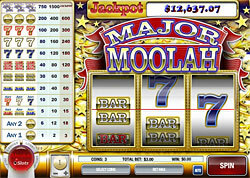 Progressive machines are considered to be the group of the slot machines that are linked together in the network. It is essential that the huge jackpot is made with the help of taking the percentage of the whole money amount inserted into the slots machine. It means that the jackpot is growing constantly and rapidly in such slots as much as many people are playing them, until someone hits the progressive jackpot. Because of the percentage of the played coins from the jackpot, the progressive jackpot can be sometimes less than in the other types of slots in the house like video slots, for instance. This is truly so for the slots that can offer the real life changing jackpots. However, not all slots progressive and are the same. Such kind of the of progressive slots is not linked to the network. Instead of some particular fixed jackpot, the stand-alone slots take the coin percentage played and then add them to the highest winning combination amount. The meter on the front can display to the player the amount of the jackpot. In the majority of cases the payout is traditionally equal to the other slots of the same denomination; however it is distributed in a different way giving the player the varying total amount for the prize. Thus, the jackpots on the progressive slots may be even lower than on slots connected in a network. This very group usually belongs to the casino slots and is operated by it with the help of linking machines together. Such slots are traditionally located in a single gambling establishment or connected with few properties in a case if the gambling company runs more than one casino. The jackpots are not necessarily multi million; however, they can be pretty solid in some houses. In addition, they are hit much more often in comparison with the progressive of wide area. The wide area slots are called the progressive slots that can offer the real exchange jackpots. It is interesting that such slots may be connected from different areas, that is even in unrelated houses. Such slots are more likely to be operated by some independent operator rather than some gaming company. In fact, the house may share in the winning g percentage, but the operator as a rule owns the game itself. Jackpot can be large, so can the player's chances. In fact due to the slots linking and some administrative costs for running the wide area games, the payback percent on such slots can be lower in comparison with the other.